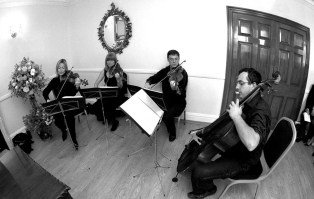 A professional and experienced string quartet based in London and the surrounding counties of Bedfordshire, Berkshire, Buckinghamshire, Essex, Hertfordshire, Kent, Middlesex, Surrey and Sussex. "What can I say? You made such a wonderful difference to our wedding ceremony - thank you so much." "Just a little note to say that all concerned were absolutely delighted with the Adriamus quartet. 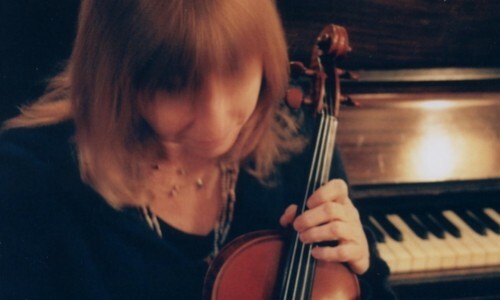 The precision and effortless bravura of their playing really helped to make the occasion special." 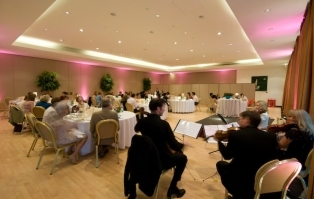 We provide music for all kinds of occasions, from weddings, civil partnerships and birthday parties, to dinners and corporate functions. Teaming up with a tabla player, we are also able to provide music for Asian weddings. We can even add a drummer to the ensemble for more up-tempo music for dancing! If space or budget is restricted, Adriamus can scale down to a trio or even a duo when required. Adriamus have provided backing strings for Alesha Dixon, Pet Shop Boys and Girls Aloud hit - 'The Promise'.